there’s a method to backup the entire Duplicati configuration before a windows reset? @Bazzu85, you should be able to export each backup job’s settings to a file individually and just make sure you store that file somewhere that is NOT going to get reset (such as a cloud or USB drive). After your Windows reset and re-installation of Duplicati you should be able to just use Add backup and select Import from a file to select your previously saved config(s). Note that you should review the imported config before actually running it to make sure Source data is still correct (for example User names and paths may have changed). And if your Destinaion was a local drive make sure it’s still the correct drive / drive letter. However I don’t know of any “back up every config” option that would store multiple jobs in a single export (if that’s specifically what you were looking for). I would suggest to make a copy of the %appdata%\Duplicati folder. If you run Duplicati in portable mode using the --portable-mode option, you have to copy the data folder, located under the Duplicati program folder. In this folder everything is stored that is needed by Duplicati (Backup jobs, global settings, program settings, local databases, etc.). Restoring this folder to a computer with a clean installation should revert Duplicati completely to the state it was when creating the copy of these files. Exporting all backup jobs to JSON files is a good idea, because all settings of a backup job can be retrieved from the JSON file, which is a lot easier then pulling these settings from the SQLITE file. but why there isn’t a complete server data backup? What would be contained in that ? Duplicati is “file-level” backup so you can only store files. To store the entire “server data” you would need to do a “block-level” backup, in case that is what you are requesting. I think the question is about “DUplicati server” configuration backup vs. single job export. If you run Duplicati in normal install mode. Going further into the details - all server configuration is in Duplicati-server.sqlite file and each job is kept in the rest of .sqlite files. I suggest you quit Duplicati tray icon before making backup of .sqlite files. Restore my system from an image backup created with an image backup package such as AOMEI, Acronis, etc. Update Duplicati to the latest version, since my image backup might be several weeks old. Overwrite %APPDATA%\Duplicati\duplicati-server.sqlite with the version that is in my most recent Duplicati backup. Yes, if you have Duplicati-server.sqlite it contains all the backup configurations (and some log data). FYI, I started off backing up the whole Duplicati AppData folder, but had to go back and scope it down to just back up the Duplicati-server.sqlite database. The other sqlite database in the Duplicati folder for my primary backup job is about 4GB and seems to have lots of churn throughout so it was backing up almost the full 4GB every backup. @sanderson, you must by psychic, because that’s exactly what I was doing – backing up the whole folder “just in case”! Thank you for posting this follow up. I’ll update my configuration. I changed this, as some users reported that AD would “sync” the Roaming folders, so now it uses %LOCALAPPDATA% unless it finds a (-n old) database in %APPDATA%. I checked Windows 7 & 10 and I’m not seeing a %APPDATA_LOCAL% - however, I am seeing %LOCALAPPDATA%. Is %APPDATA_LOCAL% specific for Duplicati? %LOCALAPPDATA% looks like the right one, I will edit my post. always include a copy of the Duplicati-server.sqlite database in all backup jobs? I keep thinking the same thing. Then I remember my 100G backup has a 500M+ sqlite file. That’s a lot to upload… And I’m not sure how static it is with updates so even with compression or deduplication it might be kinda big. On top of that, I think it would need to be encrypted as well to keep security tight. Good point about the size – I had not thought to check that. The database size for my 241GB backup is only 250KB. There are other files in that directory that are much larger – one to as large id 2.62GB – but those aren’t needed to restore the configuration. Is your Duplicati-server.sqlite so large because of the number of backups you have created? Would it make sense to always include a copy of the Duplicati-server.sqlite database in all backup jobs? We have discussed this quite a bit before, both @renestac and @agrajaghh have suggested different ways to accomplish this. Storing it is already implemented. 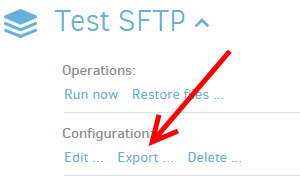 Simply add the advanced (and undocumented) option --store-task-config=all (or --store-task-config=this). There is not a way to extract the configurations, but the code to do so is implemented in ListControlFiles.cs and RestoreControlFiles.cs. The problem is that the database contains sensitive information (logins etc) and if you store the database with all backups, you are really spreading the sensitive information to many different sources, some which may be unencrypted. When it comes to restoring the configuration, you need to enter: encryption passphrase, destination and credentials. After this the configuration can be downloaded, but you just entered most of the information that is stored. The rest of the information (paths etc) are unlikely to have meaning on the system you are restoring on.